Mount Shasta highlights the horizon from Billys Peak. 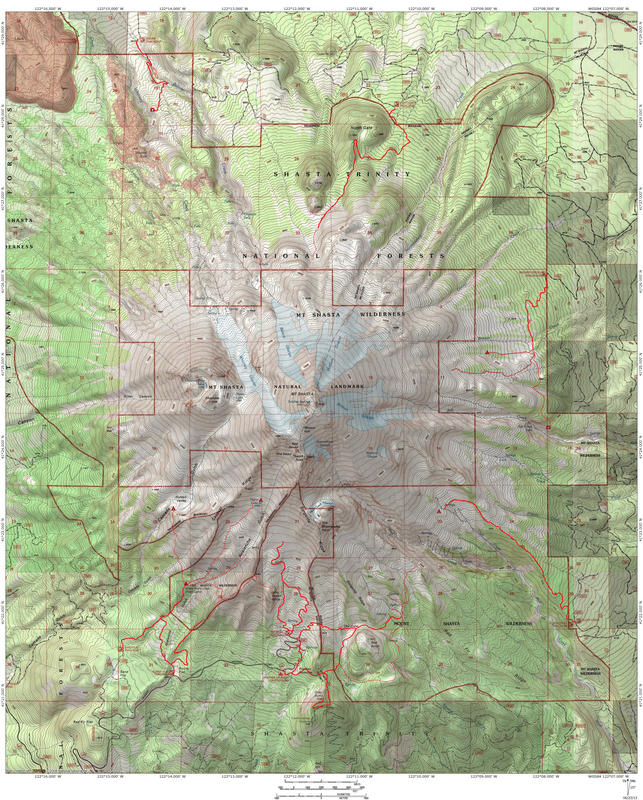 While the Mount Shasta region has a significant amount of wild, primordial land, its proximity to populated areas, lines of transportation and agricultural areas has had its effect and much of the land has felt civilization’s touch. That is why I find it comforting that a place like the Trinity Alps is so close. This subrange of the KIamath Mountains is vast and spectacular. Here it is possible to enter the wilderness amidst staggering mountains and roaring rivers and not emerge for weeks at a time. It is like having that vaunted Sierra Nevada tucked away behind the Trinity Divide (the mountain range immediately west of Mount Shasta), waiting to embrace those seeking wilderness immersion. 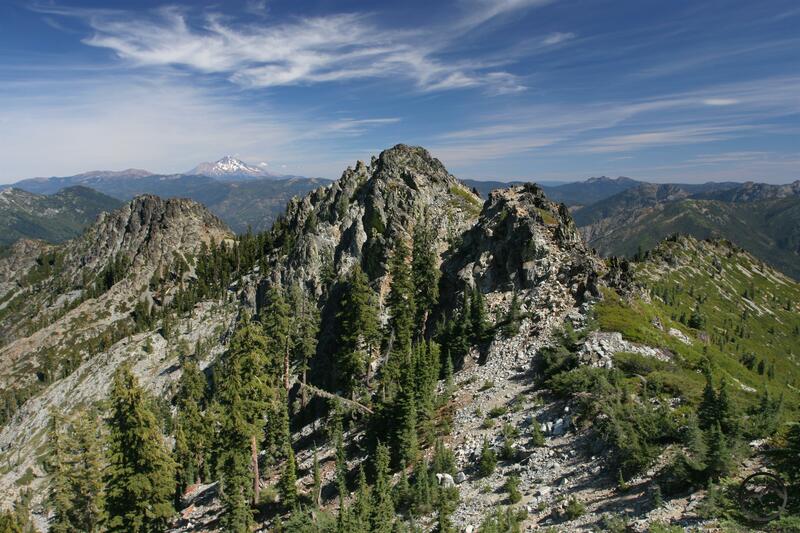 However, for all of its vastness, the Trinity Alps is not entirely separated from Mount Shasta. More than any other set of mountains beyond the great volcano’s immediate vicinity, the hikes in the Trinities feature prominent views of Mount Shasta. It is a constant reminder of how close the mountain is and just how big it really is. One particularly neat aspect of observing Mount Shasta from the Trinity Alps is to see it surrounded by all of the mountains in its vicinity. Unlike other views nearer the big cone, you can witness towering above not only the mountains to its east, but also Mount Eddy and the Trinity Alps. This really drives home just how massive it is and how far above all of its neighbors Mount Shasta soars. Most of the trails where Mount Shasta is prominently visible are those along the east and northeastern ends of the wilderness area. These trails wind through mountains that loom high above the Trinity River, which forms the divide between the Trinity Alps and the Trinity Divide (I know it is confusing!). The paths climb through beautiful canyons to high lake basins surrounded by towering peaks of granite and peridotite. The scenery here is an excellent complement to Mount Shasta vistas. Towering granite cliffs and turrets loom high above glittering alpine lakes. Expansive meadows and deep forests blanket the area and teem with wildlife. Some of the best examples of trails that boast good views of the monarch mountain are the Bear Lakes Trail and the Pacific Crest Trail, as it weaves along the crest of the northeast corner of the Trinity Alps. The trails deeper in the interior of the Trinity Alps travel through taller mountains and much more rugged terrain, which obscure views from all but the tallest peaks where no trails reach. The only exception to this is the route which reaches the summit of Monument Peak, though the view of Mount Shasta from here is not quite as good. Still, those places where Mount Shasta is visible have exceptional beauty of their own and are worthy of exploration. On the horizon from Tapie Lake. Mounts Shasta and Eddy from the Trinity Alps. Peeking out from behind Granite Peak. Looks amazing! Love the pictures.